Have a Rasta-themed event coming up sooner than you can grow dreadlocks? 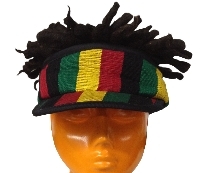 Our new poly/cotton visor in assorted Jamaican patterns comes with its own! Plus, those dreads are removable turning it from a novelty item into simply a great-looking way to keep the sun out of your eyes! Velcro adjustable.